3. Institute of Chinese Medicine, Southwest University, Chongqing 400715, China. Hunting for an effective medicine for brain stroke has been a medical task in neuroscience for decades. The present research showed that the lyophilized Powder of Catalpol and Puerarin (C-P) in all the tested doses (65.4 mg/kg, 32.7 mg/kg, 16.4 mg/kg) significantly reduced the neurological deficiency, infarct volume and apoptotic cells in ischemic/reperfusion (I/R) rats. It also promoted astrocyte processes and prolonged neuron axons in infarct area. Further, it decreased MDA, NO, NF-κB/p65, TNF-α, IL-1β and IL-6 and enhanced the EPOR and GAF-43. 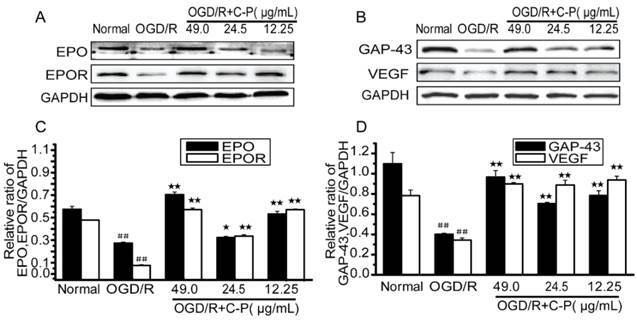 65.4 mg/kg and 32.7 mg/kg C-P could up-regulated EPO and VEGF significantly. In vitro, 49 μg/mL and 24.5 μg/mL C-P decreased the leakage of sodium fluorescein and increased the activity of γ-GTP. Additionally, it increased SOD and decreased MDA, NO, and LDH and decreased NF-κB/p65, TNF-α, IL-1β and IL-6 and unregulated EPO, EPOR, VEGF, and GAP-43. Only the dose of 49 μg/mL increased TEER and Claudin-5 and turned the typically damaged morphologies of neurons, astrocytes and endothelium into a favorable trend. These data imply that C-P improved the recovery of neurological deficiency in motor, sense, balance and reflex, and protected the whole NVU by anti-oxidative stress, anti-inflammation and up-regulating some protective factors. This research provides a candidate medicine for brain stroke and, at the same time, a pattern for drug study targeting NVU in vitro. Keywords: Neurovascular Unit, Lyophilized Powder of Catalpol and Puerarin, Brain stroke, Oxygen and glucose deprivation, Neuroprotection. Although Recombinant Tissue Plasminogen Activator performs excellently on stroke, very few (about 5%) stroked patients in acute period were benefit from the drug [1, 2] because of the short time-window of treatment and high risk of hemorrhage [3, 4]. Researchers have been developing an alternative one for the disease for more than 50-year, however, as American Stroke Association highlighted in 2013, there is no one drug available for stroke as a neuroprotective agent . So, what is responsible for those failures? Increasing researchers point out the main cause of the failures is that the treatment only targets one type of cerebral cells rather than a functional unit. Based on this, a new idea came out that the treatment of brain stroke should target the whole functional unit, the Neurovascular Unit (NVU). NVU, mainly consisting of microvessels, astrocytes, neurons, extracellular matrix and other types of gliocytes is defined as a whole functional and structural unit of brain . It is regarded that not only neurons suffer from stroke, but also the microvasculature and gliocytes are involved . And the interactions among these types of cells are crucial for treating the disease . Hence, the protection on Neurovascular Unit becomes the most potential strategy to conquer brain stroke [8, 9]. Based on this strategy, we have established a NVU model for in vitro study. 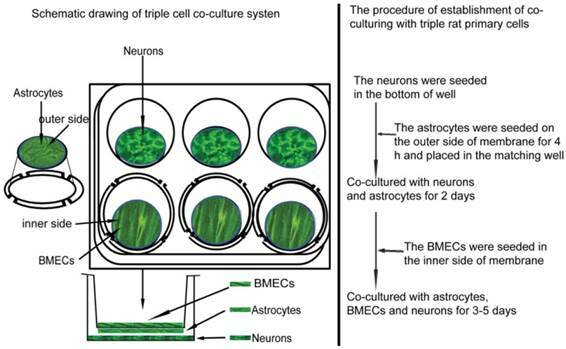 It is a triple-cell co-culture system which consists of three kinds of primary cells including neurons, astrocytes and microvascular endothelial cells. We further observed several crucial pathologies of brain stroke on this model via OGD/R, which suggests the applicability of the model in brain research and screening for related candidates . Lyophilized Powder of Catalpol and Puerarin is a preclinical candidate consisting of Catalpol and Puerarin which are two pharmacologically effective ingredients isolated from Rehmannia glutinosa Libosch and Radix Puerariae, respectively. Previous studies have convinced the safety of the medicine and the ability of crossing BBB [11, 12]. It also performed an excellent anti-stroke on permanent middle cerebral artery occlusion mouse with prominent anti-oxidative stress injury, anti-apoptosis, and promoting angiogenesis and neurogenesis . Additionally, C-P protected human umbilical vein endothelial cells from inflammation, oxidative stress injury and apoptosis . This research will evaluate the protection of C-P on NVU on I/R rats and OGD/R-damaged NVU models in vitro. It will cover pathologically and protectively crucial sides including the permeability of BBB, oxidative stress injury, inflammation and some protective factors. All experiments follow an institutionally approved protocol in accordance with the China's Guidelines for Care and Use of Laboratory Animals. Sprague-Dawley rats were purchased from the Experimental Animal Center, Chongqing Research Institute of Chinese Medicine (Chongqing, China) and housed under controlled environment (22 ± 2℃, 12 h light/dark cycle, free access to food and water) in the Experimental Animal Center, College of Pharmaceutical Sciences, Southwest University (Chongqing, China). 0-10 day rats were sacrificed for isolating the three types of the primary cells, and 260-300 g male rats were performed the I/R model. The qualitative control of C-P was performed on HPLC (Agilent 1200, USA). Chromatographic conditions: column Agilent Zorbax SB-C18 (4.6 mm × 250 mm, 5 μm); eluent: water and acetonitrile (Adamas-beta Co., Ltd, Shanghai, China) for gradient elution; the monitoring wavelength was set at 210 nm for catalpol and puerarin; flow rate was 1.0 ml/min and the column temperature was 30℃; the sample size was 10 μl. The HPLC analysis was validated and met the methodological requirements. The establishment of I/R rats was performed as previous report . Basically, SD rats were anesthetized with 4% chloral hydrate for surgery after 3-daypre-training of balance beam. After midline skin incision, a length of 4-0 monofilament nylon suture was put into the left external carotid artery to occlude the Middle Cerebral Artery. 2 hours later, the line was removed away for reperfusion. During the whole surgery, rats were kept in temperature of 37℃. The rats for sham operation suffered the same with I/R rats but without putting the line into artery. 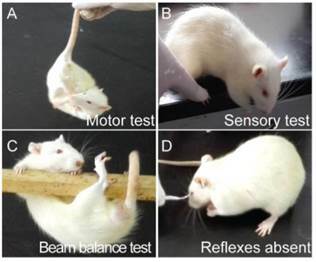 After scored by modified neurological severity scores (mNSS) which consists of motor, sensory, reflex, and balance tests , only I/R rats whose neuroscores (Figure 1) were not below 4 were regarded as qualified candidates for following tests. 72 qualified rats were numbered and then averagely divided into 4 groups of I/R and three gradient doses of C-P (65.40 mg/kg, 32.7 mg/kg, and 16.4 mg/kg) by completely randomized digital table. The neuroscore of each group was evaluated by mNSS to confirm no significant differences between groups (Table 1). Another 18 rats were for sham. The first administration of C-P was performed by a tail intravenous injection after rats were grouped, and the last was 12 hours later. The duration of the treatment with C-P was 24 hours. The sham group and I/R group were given the normal saline with the same volume of C-P groups. The neurological behavior test on I/R rats (A) Motor test showed the head of the I/R rat moved over 10° to vertical axis within 30 s; (B) sensory test showed the limb muscle of the I/R rat failed to be stimulated while its paw was pushed against the table edge; (C) beam balance test showed the I/R rat attempted to balance on the beam but fell off; (D) I/R rat was absent of corneal reflex while cornea was touched by cotton. 24 hours later, neuroscore was evaluated by mNSS to observe the effect of C-P on neurological deficiency. 6 rats of each group were sacrificed for obtaining fresh brains. Each brain was cut into 7 slices with 2 mm per slice by Brain Matrices (1 mm 175-300, RWD Lifescience Technology Co., Ltd., Shenzhen, China). Slices were merged into 2% TTC for 30 min in 37℃ and then preserved in 4% paraformaldehyde for 24 hour. After taking pictures, infract tissue was qualified by IPP software (Image-Pro Plus, Version 6.0., Mediea Cybernetics, Inc.) and presented as: Percentage of Infarct Volume = Infarct Volume/ The Volume of The Whole Brain ×100%. 6 rats of each group were sacrificed for brain slices of 8 μm. TUNEL stain was followed by the direction of the kit. Pictures were analyzed by IPP. Then, apoptotic rate = the number of the TUNEL+ cells / the total number of cells ×100%. Immunofluorescence was performed as described below. Briefly, slices were blocked by 5% BSA in 37℃ for 1 hour, and then respectively incubated with primary anti-bodies of NF200 (1:200), GFAP (1:200) and vWF(1:200) in 4℃ overnight. After washed with PBS for 3×5 min, slices were incubated with the secondary anti-bodies and DAPI in dark. Pictures were captured by a fluorescence microscope (DFC310, Leica, Germany) and then analyzed by IPP. Specifically, the average of fluorescence density = the total value of fluorescence / the number of cells. The levels of NO, MDA, LDH and SOD were detected by ELISA. All producers follow the direction of the kit. The absorbance of each sample was detected by Biotek (ELx800, USA) at 490 nm. Following the direction of kits, the nuclear extracts for detecting NF-ΚB/p65 and the total proteins were extracted from brain tissues, and samples containing 20-30 μg were loaded onto 10% Tris/Glycine SDS-PAGE gel for electrophoresis. After transferring to PVDF membranes (Millipore), the membranes were blocked in 5% skim milk for 1 hour. Then, membranes were incubated overnight at 4℃ with following primary antibodies, anti-GAP-43 antibody (1:1,000 ), anti-EPO antibody (1:300), anti-EPOR antibody (1:1,000), anti-VEGF antibody (1:800), anti-TNF-α antibody (1:1,000), anti-NF-ΚB/p65 (1:1,000) antibody, anti-IL-6 antibody (1:1,000 ), anti-IL-1β antibody (1:300) and anti-GAPDH antibody (1:10,000). Then, they were incubated with peroxidase-conjugated secondary antibodies, and visualized by ECL (Millipore) with Gel Image Analysis System (Tanon-3500R, Shanghai, China). Optical density was analyzed by image analysis software. The primary cerebral endothelial cells and astrocytes were followed as previous report [18, 19]. The cultures of primary neurons were performed as described  with some improvements. Briefly, cerebral cortexes were departed from brains and cut into sections as small as possible. Then the tissues were incubated with 0.25% trypsin in 37 ℃ for about 10 min for acquiring single cell suspension. The cells, then, were cultured in FBS-free DMEM/F12 medium containing 2% B27. 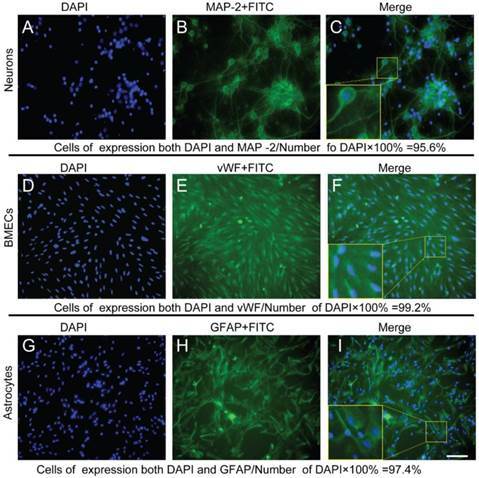 For the immunophenotyping of the three types of primary cells, cell markers of MAP-2, vWF, and GFAP were selected for neurons, endothelial cells, and astrocytes respectively. In parallel, the rate of cellular purity was analyzed by the formula: the rate of purity = the number of cells with DAPI+ and marker+ / the number of DAPI+. The NVU model was established according to our previous report . Briefly, as shown in Figure 2, after the neurons has grown in a 6-well culture plate with a density of 0.5×105 cells/cm2 for 2 days, the purified astrocytes with 1.5×105 cells/cm2 were seeded on the outer side of insert membrane which side faces the bottom of the well. After 4 h for astrocytes adhering, the insert was placed into the well with neurons. 2 days later, BMECs (1.0×105 cells/cm2) were seeded in the inner side of the insert membrane. After co-cultured for 3-5 days, the NVU model was prepared for following experiments. The illustration of constructing NVU in vitro. Experiments were conducted as our previous descriptions with some improvements . Briefly, the prepared NVUs were cultured in conditional medium (glucose-free, 98.5 mM NaCl, 10.0 mM KCl, 1.2 mM MgSO4, 0.9 Mm Na2HPO4, 6.0 mM NaHCO3, 1.8 mM CaCl2, 40 mM Sodium lactate and 20 mM HEPES with pH6.8) and placed in an anaerobic incubator (BINDER CB150, Germany) with condition of 5% CO2, 0.2% O2, and 37℃ for 2 h. Then cultures were switched to completely normal conditions for 22 h. The successfully damaged NVUs were of phenotype of contracted cells and typically decreased TEER (P<0.05). NVUs were randomly divided into 5 groups (n=6) of normal, OGD/R and three doses of C-P (49.00 μg/ml, 24.50 μg/ml and 12.25 μg/ml). C-P treatment was performed when the cultures were switched to normal conditions. After OGD/R, the images of astrocytes, neurons and BMECs in each group of in vitro NVU models were captured by an inverted phase contrast microscope (Carl Zeiss IX 71, Germany). Then, the axonal length of neurons in each group was analyzed by IPP software. After digestion with trypsin, the number of survival astrocytes and BMECs were counted by trypan blue. TEER values of NVUs were measured by an epithelial-volt-ohm resistance meter (ERS-2, Millipore, USA) according to its instructions and previous report . The TEER value of the well without cells was regarded as background. The final TEER value = (sample TEER value - background TEER value) × the area of membrane. The values were expressed as Ω·cm2. The flux of SF across the endothelial cells was performed as previously described . Briefly, cultures were switched to 1 ml DMEM-F12 medium containing a final concentration of 10 μg/ml SF. After incubated for 2 hours, 100 μl medium under the transwell membrane was taken out. The absorbance was measured by fluorospectrophotometer (HITACHI F-4500, Japan, emission wavelength: 525 nm; excitation wavelength: 440 nm). Endothelial cells in the inner side of membrane were lysed on ice for 10 min by RIPA (Beyotime Institute of Biotechnology, Haimen, Jiangsu, China) after astrocytes had been scraped off. After being centrifuged (4℃, 13,000 (×g) for 10min), the supernatants were collected to test the γ-GTP activity. The supernatants of the NVUs were collected for the test of NO, MDA, LDH, and SOD. During the whole experiment, PMSF was used to protect proteins from degradation. All the experimental procedures follow the direction of the kit. Cells in the NVUs were respectively scraped down and lysed on ice for 10min. After centrifugation (13,000(×g), 4℃), the resulting supernatant was saved as the cytoplasmic extract sample and the nuclear pellet was prepared for nuclear extract sample. Samples were used for measuring the expressions of GAP43, EPOR, Claudin-5 and NF-ΚB/p65, respectively. The lyophilized cultures supernatants were used to measure the secreted proteins including VEGF、EPO、TNF-α、IL-1β and IL-6. All of these proteins were measured by Western Blot. Specific procedures were followed as previous descriptions in this research. All the results were repeated at least three times. All pictures were analyzed by IPP software. Data were statistically analyzed by ANOVA (SPSS 17.0). Results were expressed as mean ± SD. P < 0.05 was regarded to be statistically significant. As shown in Figure 3, the retention times of catalpol and puerarin in C-P (C) were consistent with the standards of catalpol (A) and puerarin (B). This suggests that C-P contained catalpol and puerarin. 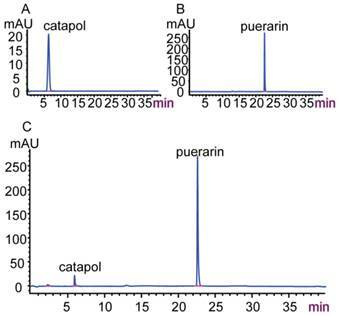 High-performance liquid chromatogram of C-P (A) Catalpol standard; (B) Puerarin standard; (C) C-P.
C-P decreased the infarct volume (A) Infarct tissues were stained by TTC. (B)The percentages of the infarct volume in I/R and C-P groups indicated C-P decreased the infarct volume significantly (values represent mean ± SD, n = 6); ## means P<0.01 (I/R versus sham); ★ means P<0.05, ★★ means P<0.01 (C-P versus I/R). The infarct tissues were typically expressed as white after stained by TTC (Figure 5 A). The average rate of infarct volume to whole brain in C-P groups (65.4 mg/kg、32.7 mg/kg and 16.4 mg/kg) (Figure 5 B) were 14.79%, 17.78%, and 28.72%, all of which were significantly decreased compared with I/R rats (33.7%) (P<0.01, P<0.05). vWF, GFAP, and NF200 staining were respectively used to observe the morphologies of vessels, astrocytes, and neurons in infarct area. As showed in Figure 7 B, vessels in I/R group were fragmental instead of an intact one as showed in Figure 7 A. Also, obviously shortened astrocytes processes (Figure 7 G) and disappeared axons of neurons were observed simultaneously (Figure 7 G, L). For quantity analysis, the average intensity of fluorescence of each group was calculated. The data were in accordance with the morphological observation (P<0.01). With the intervention of C-P with the three doses, only the doses of 65.4 mg/kg and 32.7 mg/kg weakened these damage manifestations (P<0.01) except for the dose of 16.4 mg/kg (Figure 7 C-E, H-J, M-O). Figure 8 shows that MDA, LDH, and NO were increased and LDH was decreased significantly in brain tissue in I/R group (P<0.01). C-P turned such an adverse trend into a favorable one. 65.4 mg/kg and 32.7 mg/kg C-P reduced the levels of MDA, LDH, and NO and enhanced the level of SOD compared with I/R rats (P<0.01). However, 16.4 mg/kg C-P significantly increased MDA, LDH, and NO (P<0.05, P<0.01) but not SOD (P = 0.12). Figure 9 shows that NF-κB/p65, TNF-α, IL-1β and IL-6 were upregulated in I/R rats (P<0.01). In addition, 65.4 mg/kg, 32.7 mg/kg and 16.4 mg/kg C-P decreased all inflammatory factors to various extents (P<0.01). 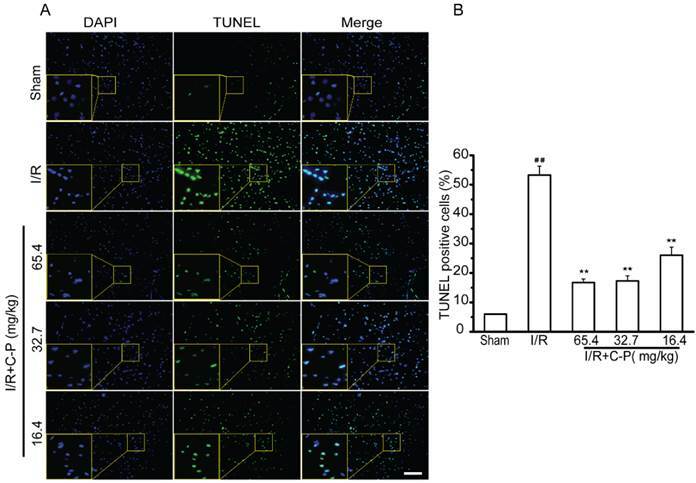 C-P decreased apoptotic cells in infarct region (A, B) By TUNEL stain, C-P was proved to protect cerebral cells from apoptosis (Bar = 100 μm) (values represent mean ± SD, n = 6); ## means P<0.01 (I/R versus sham); ★★ means P<0.01 (C-P versus I/R). C-P improved the morphologies of the three main types of cerebral cells in infarct region (A-E) The morphologies of vasculatures observed by immunofluorescence of vWF and DAPI. (F-J) The morphologies of astrocytes were observed by immunofluorescence of GFAP and DAPI. (K-O) The morphologies of neurons were observed by immunofluorescence of NF200 and DAPI. (P-R) The average of fluorescence densities of vWF, GFAP, and NF200 in each group, which suggests that C-P improved the morphologies of the three types of cells (Bar = 50 μm) (values represent mean ± SD, n = 6); ## means P<0.01 (I/R versus sham); ★ means P<0.05, ★★ means P<0.01 (C-P versus I/R). C-P protected brains from oxidative stress injury in I/R rats (A-D) The levels of MDA, SOD, LDH, and NO in each group were tested by ELISSA. 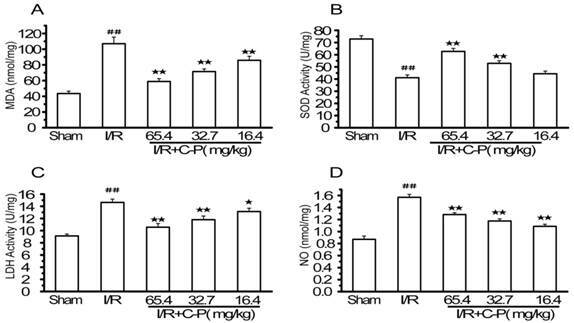 Results suggested C-P had an effect of anti-oxidative stress injury in vivo (values represent mean ± SD, n = 6); ## means P<0.01 (I/R versus sham); ★ means P<0.05, ★★ means P<0.01 (C-P versus I/R). 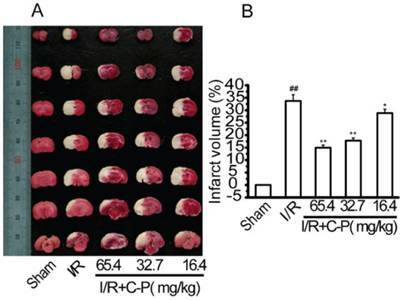 C-P protected brains from inflammation in I/R rats (A, B) The expressions of TNF-α, NF-ΚB/p65, IL-6 and IL-1β in each groups were tested by Western Blot. (C, D) The semiquantitative analyses for these proteins in all groups suggested C-P had an effect of anti-inflammation in vivo. (values represent mean ± SD, n = 6); ## means P<0.01 (I/R versus sham); ★★ means P<0.01 (C-P versus I/R). C-P promoted the expressions of favorable factors in I/R rats (A, B) The expressions of EPO, EPOR, GAP-43, and VEGF in each group were tested by Western Blot. (C, D) The semiquantitative analyses suggested C-P significantly improved these factors in vivo. (values represent mean ± SD, n = 6); ## means P<0.01 (I/R versus sham); ★ means P<0.05, ★★ means P<0.01 (C-P versus I/R). 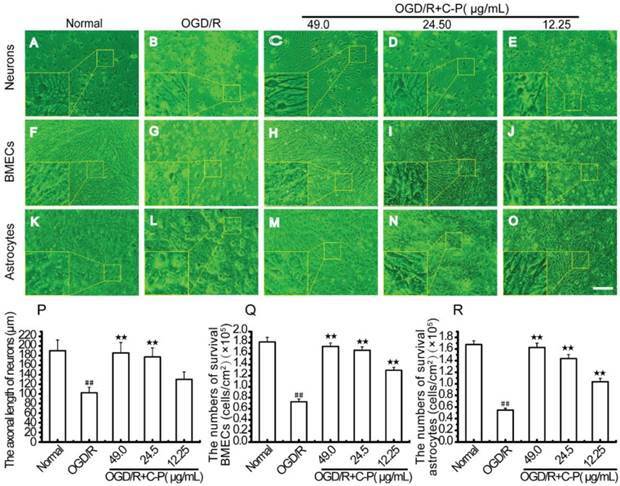 As shown in Figure 12, the three types of cells were of typical damage manifestations after OGD/R. But with treatment of C-P with doses of 49 μg/mL, 24.5μg/mL, and 12.25μg/mL, these manifestations were all weakened, the axonal length of neurons and the numbers of BMECs and astrocytes were increased. TEER, γ-GTP, and Claudin-5 were selected to evaluate the permeability of BBB in in vitro NVU models. After OGD/R, all of these indexes were significantly decreased, which suggests that the BBB was damaged (P<0.01). Meanwhile, this damage was confirmed by the increased absorbency of SF after OGD/R (P<0.01). With treatment of C-P with doses of 49 μg/mL, 24.5 μg/mL, and 12.25 μg/mL, all the indexes were turned into a favorable trend to different degrees (P<0.05, P<0.01, Figure 13). 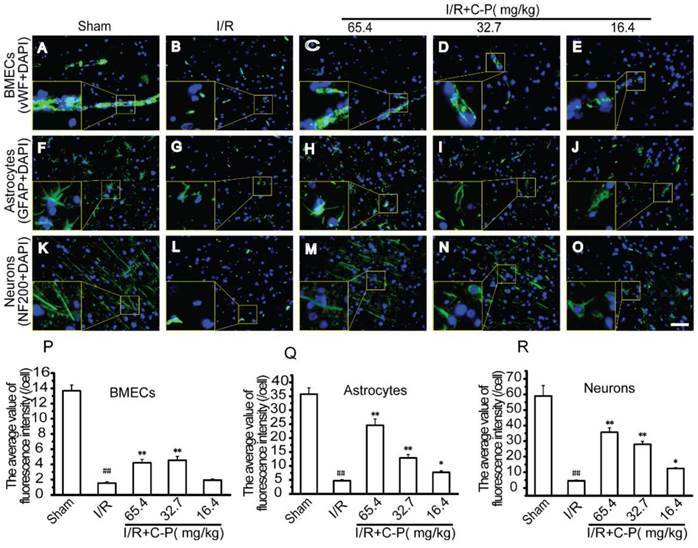 Immunophenotyping controlled the qualities of the neurons, endothelial cells, and astrocytes used in NVUs (A-C) Immunophenotyping of neurons were identified by MAP-2, and cell purity was beyond 95%. (D-E) Immunophenotyping of endothelial cells were identified by vWF, and cell purity was beyond 99%. (G-F) Immunophenotyping of astrocytes were identified by GFAP, and cell purity was beyond 97% (Bar = 50 μm). C-P improved the cellular survival and the morphologies of the three types of cells in NVU models (A, F, K) Pictures show the morphologies of health neurons, endothelial cells, and astrocytes. (A) The bodies of neurons were extended, and axons formed a compact network. (F) Healthy endothelial cells touched with each other to form a compact monolayer. (K) Normal astrocytes had an extended body and tightly touched with each other. (B, G, L) Pictures show the morphologies of the three types of cells after OGD/R. (B) Neurons contracted their bodies and axons resulting in a sparse network. (G, L) Endothelial cells and astrocytes contracted significantly and were departed from the membrane. (C-E, H-J, M-O) Pictures exhibit the morphologies of the three types of cells with treatment of C-P (49.00μg/mL). Cells contracted slightly and less of them departed from the membrane than OGD/R. (P-R) The axonal length of neurons and the numbers of BMECs and astrocytes in each group were quantitatively analyzed, which suggest that C-P improved the cellular survival and the morphologies of the three types of cells (Bar = 100 μm) (values represent mean ± SD, n = 6); ## means P<0.01 (OGD/R versus normal);★★means P<0.01 (C-P versus OGD/R). C-P protected the BBB of the NVU models (A) The TEER of the NVU in each group showed C-P protected BBB with the dose of 49.00μg/mL. (B, C) SF absorbance and γ-GTP activity showed the doses of 49.00μg/mL and 24.5μg/mL had decreased the permeability of BBB after OGD/R. (D) Western Blot showed that C-P strengthened Claudin-5 with the dose of 49.00μg/mL (values represent mean ± SD, n = 6); ## means P<0.01 (OGD/R versus normal); ★ means P<0.05, ★★ means P<0.01 (C-P versus OGD/R). C-P protected NVU models from oxidative stress injury in vitro (A-D) Levels of MDA, SOD, LDH, and NO in each group were tested by ELISSA. 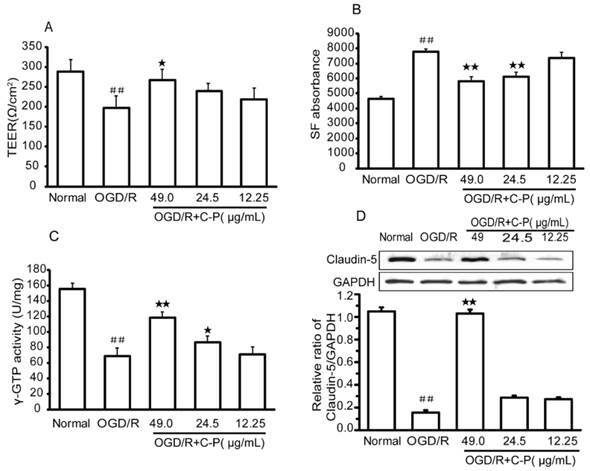 Results suggested C-P had an effect of anti-oxidative stress injury in vitro (values represent mean ± SD, n = 6); ## means P<0.01 (OGD/R versus sham); ★ means P<0.05, ★★ means P<0.01 (C-P versus OGD/R). Data obtained in this section (Figure 14) were similar to that of in vivo section (Figure. 8). Briefly, MDA, LDH, and NO were increased and LDH was decreased significantly in OGD/R group (P<0.01). C-P with doses of 49 μg/mL and 24.5 μg/mL reduced oxidative stress by performing on these factors (P<0.01, P<0.05), but the dose of 12.25 μg/mL decreased MDA only (P<0.05). Figure 15 shows NF-κB/p65, TNF-α, IL-1β and IL-6 were over-expressed (P<0.01). These results are consistent with those in vivo ones (Figure 9) and suggest that inflammation was over-activated in OGD/R group. C-P with doses of 49 μg/mL and 24.5μg/mL decreased all of these factors to different degrees (P<0.05, P<0.01). However, the dose of 12.25μg/mL only decreased TNF-α and NF-κB/p65 (P<0.01). 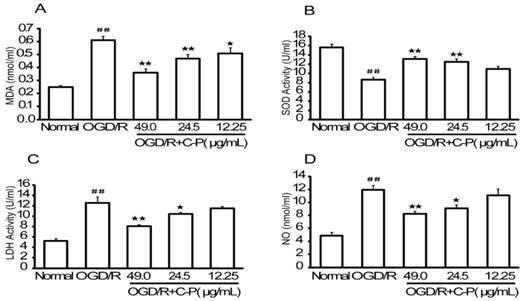 Figure 16 shows that EPO, EPOR, VEGF and GAP-43 were drastically decreased in OGD/R-damaged NVU (P<0.01) and significantly increased by all doses of C-P (P<0.01). These results are consistent with the data in in vivo shown in Figure 10. The damage of brain stroke is not only involved with neurons but also with gliocytes and microvessels [7, 23, 24]. Damaged cells can spread the damage to their surrounding cells via cellular interactions. After stroke, cerebral cells suffer from a series of pathologies as dysfunctional energy metabolism, excitatory amino acids, inflammation, oxidative stress and apoptosis [7-9]. C-P protected NVU models from inflammation in vitro (A, B) The expressions of TNF-α, NF-ΚB/p65, IL-6 and IL-1β in each group were tested by Western Blot. (C, D) Semiquantitative analyses for these proteins in all groups suggested C-P had an effect of anti-inflammation in vitro (values represent mean ± SD, n = 6); ## means P<0.01 (OGD/R versus sham); ★ means P<0.05, ★★ means P<0.01 (C-P versus OGD/R). C-P promoted the expressions of favorable factors in vitro (A, B) The expressions of EPO, EPOR, GAP-43 and VEGF in each group were tested by Western Blot. (C, D) Semiquantitative analyses suggested C-P significantly improved these factors in vitro (values represent mean ± SD, n = 6); ## means P<0.01 (OGD/R versus sham); ★ means P<0.05, ★★ means P<0.01 (C-P versus OGD/R). Therefore, treatment targeting to one type of cells or pathology is invalid. To solve this medical issue, NVU was raised. Since Professor Lo, E.H. raised it in 2003, NVU has been focused on neuroscience. It is convinced widely that protecting NVU is the most potential strategy to treat brain stroke [8, 9]. This new idea stands on the deeper appreciation of the close relationships between structure and function of cerebral cells. NVU is regarded as a functional and structural unite of brain with cerebral function. It consists of microvessels, astrocytes, neurons, extracellular matrix and other types of gliocytes. Complicated interactions among these cells can never be ignored for both physiology and pathology of brain. Therefore, the raising of NVU gives a possibility to study and treat cerebral vascular diseases better. Here, several typical pathologic changes in neurons, astrocytes, and endothelial cells which are regarded as the main components of NVU were observed on I/R rats and OGD/R damaged NVU models. These changes were in accordance with previous reports [25-27]. More importantly, C-P was proved to be able to protect the three main types of cells of NVU by enhancing favorable factors and reducing oxidative stress, inflammation, and BBB injury. The indexes observed in this research included protective and adverse factors. Typical markers of oxidative stress injury and inflammation such as MDA, LDH, NO, TNF-α, IL-1β, IL-6 and NF-κB/p65 are used to indicate the extent of brain injury [25-29]. The two pathologies not only severely damage neurons but also break BBB [26, 30, 31] which is an important structure of NVU. 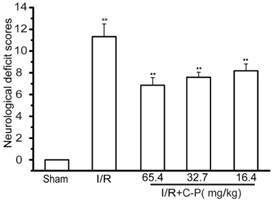 In this experimental system, C-P was shown to protect NVU from oxidative stress injury and inflammation in vivo and in vitro. Meanwhile, its protection on BBB was supported by the evidences of the decreased permeability of BBB and the increased Claudin-5 in vitro. Neuroprotective factors that protect the NVU in integrity are required to benefit at least neurons and vessels which are regarded as the core of NVU. Among these protective factors, EPO and VEGF are of the capacities prominently. EPO in brain is mainly secreted by astrocyte [32-35]. It protects cerebral cells from NO, inflammation, DNA degradation, and granulocyte infiltration [36-38] and promotes angiogenesis and neurogenesis in brain . Another notable factor is VEGF which promotes endothelial proliferation, migration, and vascular sprouting. Recent studies suggest that it is of capacities to promote neuron survival [39, 40], neurogenesis [40, 41], and neural plasticity . Additionally, the most important factor for neuron development and recovery is GAP-43 which is essential for axon growth and neural plasticity  and typically increased during axon recovery [44, 45]. All of the levels of these factors to some extent indicate the capacities of NVU against injuries and to recovery after brain stroke. Notably, C-P protected NVU in vivo and in vitro via promoting these three protective factors. All the performances of C-P suggested that C-P is a candidate medicine to protect NVU via multiple neuroprotection. Combination of Rehmannia glutinosa Libosch and Radix Puerariae was commonly used in Traditional Chinese Medicine to treat brain stroke [46,47]. As reported previously, catalpol (the primary active ingredient of Rehmannia glutinosa Libosch) and puerarin (the primary active ingredient of Radix Puerariae) inhibited inflammation via decreasing TNF-α and NF-κB [48, 49]. In term of anti-oxidative stress, they performed excellently by decreasing NO [50, 51]. Besides, enhancing EPO also was proved to be very involved in their protection on brain [52, 53]. Although catalpol and puerarin are of promoting angiogenesis and neural plasticity after brain stroke, the mechanisms are different. Bodies of reports confirmed that catalpol-induced this neural generation is relative to VEGF  and GAP-43  which haven't been proved to be involved in puerarin-induced angiogenesis; while in aspect of anti-inflammation, more articles are focused on puerarin which inhibits inflammation through lowering IL-6 and IL-1β . Hence, it seems that there is synergistic effect between catalpol and puerarin in neuroprotection. Cellular interactions are of great importance in physiological and pathological NVUs. Cells and tissues of NVU are close in structure, and even touch with each other. These lead the direct interactions between the cells [6, 23]. However, the interactions can be harmful for spreading harmful factors or be protective for favorable factors. These interactions occur in NVU when brain stroke happens [7, 24]. Based on this, every member in NVU has its specific and essential role in physiology, pathology, and even the responses to drugs. Bodies of researches have confirmed the pivotal effects of endothelial cells and astrocytes on physiological and pathological neurons [56-58]. This confirms the pivotal roles of affiliated cells in NVU. However, dose the absence of a specific type of cells, astrocytes or endothelial cells for instance, affect the responses of NVU to drugs? This is a worth research gap to be filled. C-P protected the three main types of cells of NVU in vivo and in vitro depending on anti-oxidative stress injury, anti-inflammation, protecting BBB, and up-regulating protective factors. These data demonstrate that C-P is a candidate medicine to treat brain stroke. This work was supported by the Natural Science Foundation of China (No. 81473549, No.81402441), the National Key New Drug Development Project of China (2014ZX09304-306-04), the Fundamental Research Funds for the Central Universities (XDJK2014D023 and XDJK2015D016) and the China Postdoctoral Science Foundation (No. 2014M562272). Corresponding author: Professor Xiaoyu XU, Laboratory of Molecular Pharmacology, College of Pharmaceutical Sciences & College of Chinese Medicine, Southwest University, Chongqing 400715, China. Tel. : +86-23-6825-0761; Fax: +86-23-6825-1225; E-mail: xuxiaoyuedu.cn.